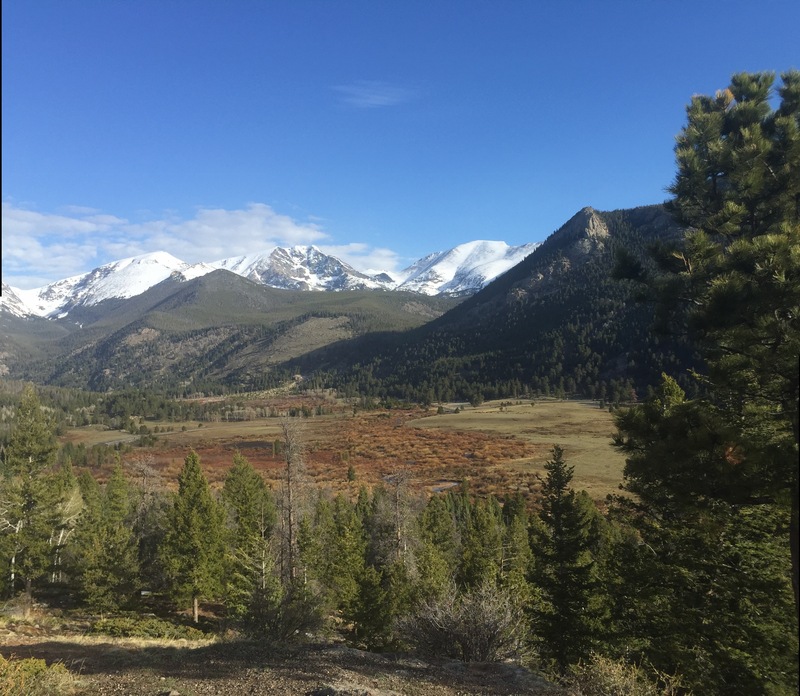 As I write this, I am in the Rocky Mountain National Park, near Estes, Colorado. Even though it’s now after 9 p.m. the trees (I think spruce and pine, but I’m not sure) and snow are simply amazing. I’ve never been here before and had no idea how many elk I would see close up. They are really amazing creatures. Of course, there is other wildlife (rabbits, wild turkeys, and a fox on the prowl) but we always seem to be drawn to the big animals. Why is that? The Rocky Mountsins really are imposing. Traveling to Denver from Mesa Verde, and ultimately from Utah and California, meant crossing the continental divide at Monarch Crest (something like 11,231 feet (I obviously can’t go online to check from here). But numbers really aren’t the point, are they? I can’t help but wonder what the first people to travel here from the eastern United States must have thought. They might have known the geologically much older Appalachian range (which have weathered over the years, becoming much smaller and rounded), or perhaps the Catskills in New York. There is just no way that prior experience could have prepared them for what we have our here. Even the relatively smaller coastal ranges such as the Sierra Nevada don’t really compare I’m shear size. And let’s not forget that the Sierra are home to Yosemite National Park, and also where the Donner party met it’s unfortunate fate. The Sierra is also a geologically young range and, by the way, the word Sierra means “jagged”. Okay, it’s darker now, with only a band of light visible above the mountains (reflected from the clouds) and stars are now visible. I wonder what the sky would look like if the moon weren’t full tonight. It rained for quite a while this evening and the skies are just beginning to clear. For someone who calls California home, this rain is actually rather refreshing (and by the way, there is drought throughout the west, it’s just at its worst in California.) I had wondered if it would snow before morning, but that seems unlikely. What is the appeal of nature? Beauty is one answer, and perhaps one of the easiest. I don’t know that there’s any one answer, but I think it helps us to feel connected, both with the world around us and, in a way, with ourselves. I think we do a lot of things, such as studying history and genealogy, or even mathematics and physics, because it helps us to feel connected – to our ancestors and what they must have experienced, to the natural world, to our families and society as a whole. You’re probably wondering what I’m doing tapping this out on an iPhone when I’m out here. To tell you the truth, so am I.